These simple mechanical machines prove a huge hit with children of all ages, in a wide variety of locations. The machines can dispense a massive variety of stock at extremely attractive profit margins. - Fully mechanical machines can be set for coinage you require - €1 vend or €2 vend. - All metal cabinet machine allow for increased security and attractiveness. - Designed to dispense 45mm bouncy balls. - Machine capacity of up to 400 balls. - Bouncy Balls cost from 27c each! - For ease of installlation and moving, machine comes with two rigid wheels and a secure metal handle. - Wide variety of stock available with huge profit margins. 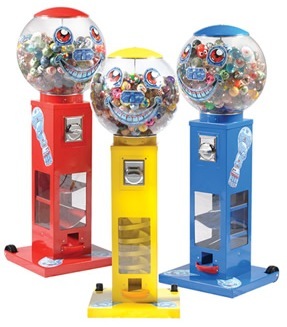 - Machine comes in a choice of colours and types - Slide or Spiral Vend/ Red, Yellow or Blue. - Seperately locking cashbox with facility for added padlock to increase security. - Dimensions - 1943mm (H) x 787mm (W) - 76.5" x 31"